"Our Barmy is a strong golden ale that lives up to its name…in a way. Some know “barmy” as slang for crazy or wacky. But historically it’s referred to the froth coming from fermenting fruit or beer, a definition that suits this brew made with apricots and orange blossom honey. With a tart fruitiness and a sweet, but not too sugary, finish, the only thing crazy about this Barmy is the amount of flavor." Pours a dark, golden orange with a transparent body and a finger of white head. I must say that the aroma is incredibly juicy and reminds me of a Welch's juice box. That apricot is really dominating everything along with some banana and the small alcohol presence is making this more of an apricot shandy. As expected from the aroma, the apricot is strong with this one. Not sure if I would dare say it is genuine apricots they are using, but the flavoring is doing its job without being too artificial. If you've had Ballast Point's Grapefruit or Pineapple variants, then the heavy dependence on the fruit flavoring will be comparable. Also as expected, this does lean heavily on the booze, but it does so without leaving an undrinkable alcohol sting. Aside from the obvious apricots, there's some cinnamon and banana, but not a lot of honey flavor aside form an overall sugary sweetness. On the second half there's a so-so apple juice quality and acidic citrus. It's not the same flavor you get from fruity hops and it had me doing a double-take with each sip. Mouthfeel is gearing more towards the syrupy side, but its not so thick that it impedes flow from one end to the other. Make no mistake, this is a big motherfu**er of a beer at 12% and a sipper by all counts, but as I said before, there is no real alcohol presence and the feel is actually relatively calm. 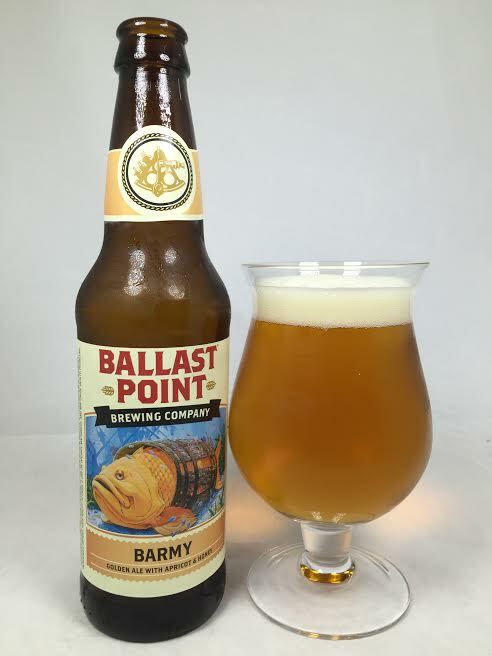 Ballast Point's more experimental brews are polarizing to say the least, but Blarmy is actually pretty good. Granted, I don't want them to start putting this in in 6-pack cans and have people slugging this down at family BBQ's, but I think it can be enjoyed one 12oz bottle at a time over the course of an hour or so. If you enjoy the shandy-like taste of Ballast Point's IPA's, but with a big, boozy body, then this is your place to be.